Just like that it’s time for falls last hurrah, Thanksgiving. It’s the perfect time to cozy up around the table with family and friends and enjoy time together. 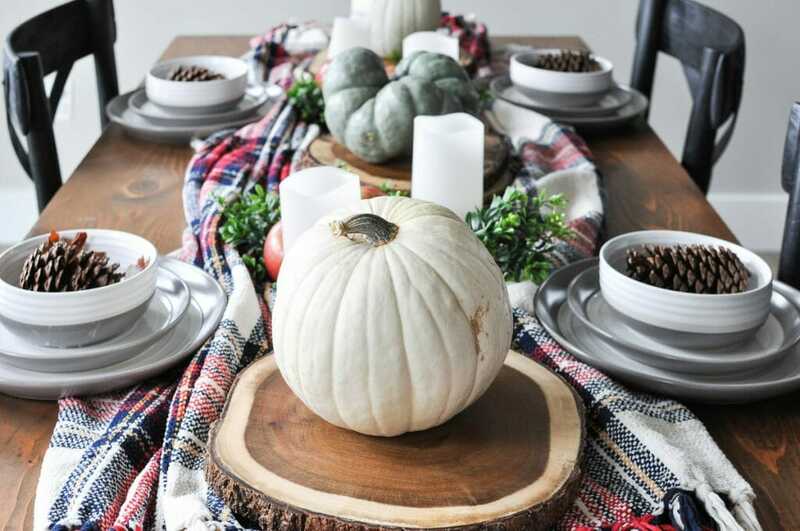 Take your dinner table to the next level with these easy and affordable last minute fall table decorating ideas our interior designers love to incorporate. Looking to take your décor past the dinner table? Check out our top fall interior design trends for even more inspiration! There is no easier way to take you tablescape to the next level than by adding fresh greenery. 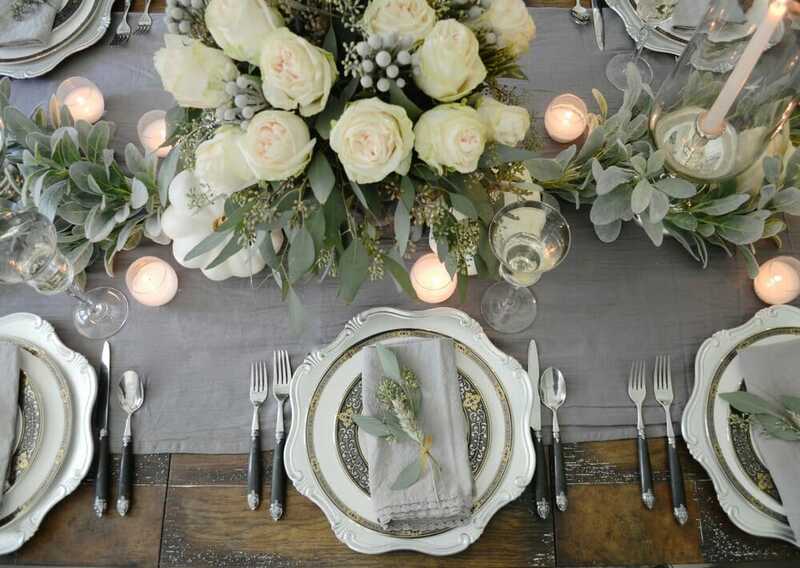 Try incorporating greenery as a runner to soften the table. If you’re going for a modern thanksgiving décor vibe garland is the perfect minimalist addition. To add more color and texture add in floral stems to the greenery to give that extra pop. Not only will the table look sophisticated, but it will smell amazing even before the food is cooked! Designer tip: purchase loose greenery to sprinkle around and give the look of a runner without actually buying garland. 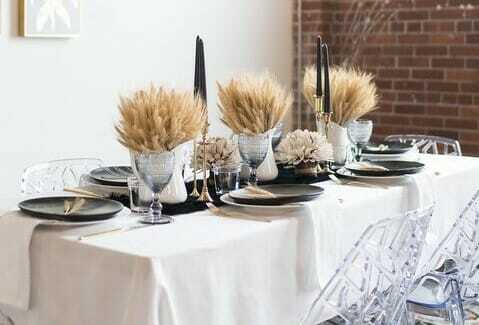 The golden tones of wheat are a great way to incorporate a warm, cozy feel to your Thanksgiving table. Using neutral décor is a great way to still be festive, but not have to incorporate colors that might not necessarily be your favorite or mesh with your current home décor. 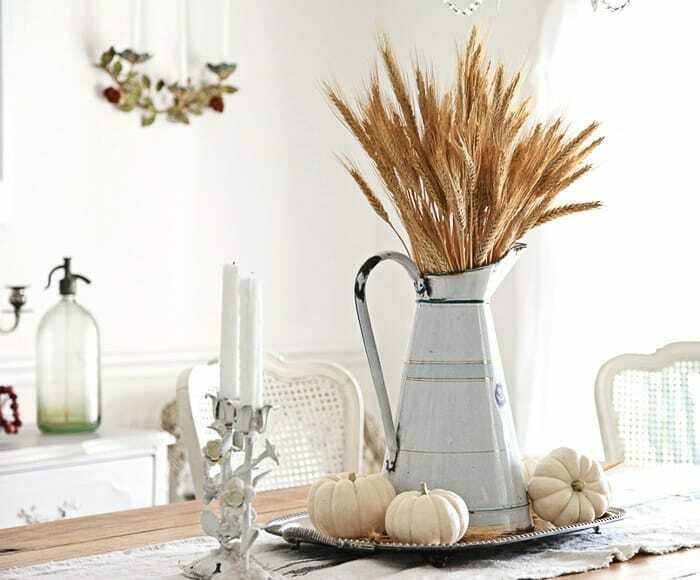 Wheat (or similar looking fake options) look exceptional when mixed with other fall decor items like pumpkins, or moody floral arrangements. Designer tip: Pampas grass looks similar and is a great alternative to using actual wheat! In addition there is always faux wheat that is great to use year after year. When thinking about how to decorate your Thanksgiving table keep in mind the other accessories you may have in your home. 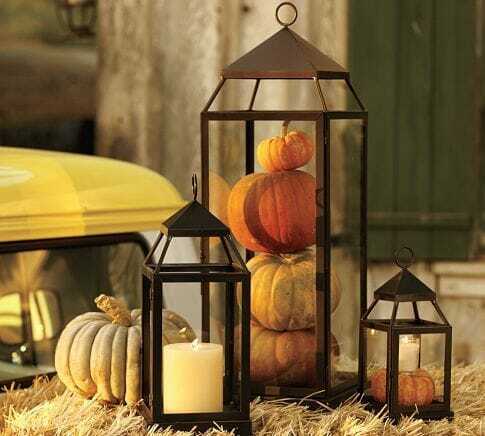 Lanterns are a great universal, inexpensive décor item everyone should own! 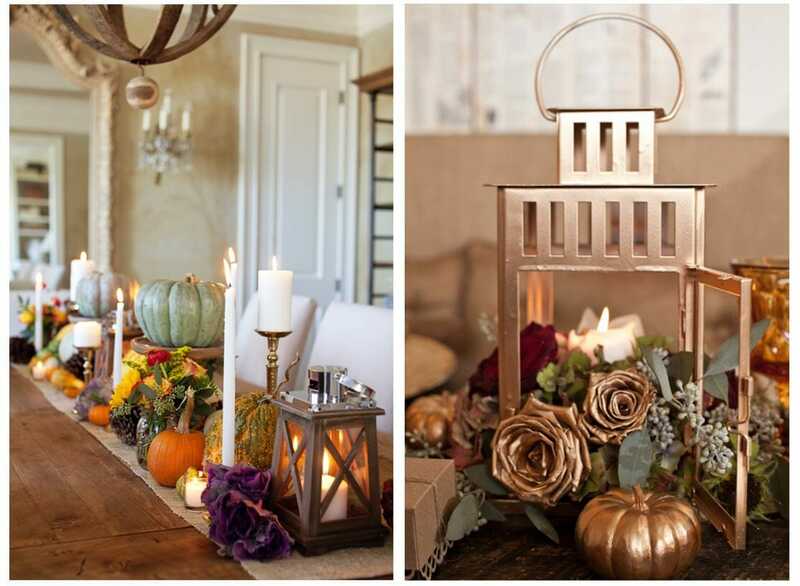 Weather you add a candle for some ambiance, or fill it with fresh floral, there are so many ways to incorporate lanterns in your modern Thanksgiving décor. 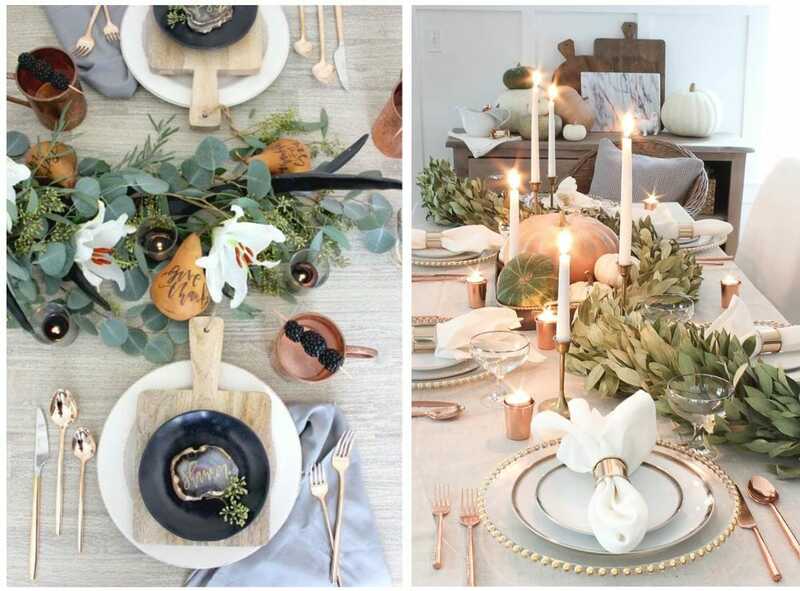 An easy way to get started with your fall table decor is to start with one central piece you’d like to be the focal point. What better place to start than a lantern! Designer tip: Have lanterns dedicated to holiday décor. Such an easy and festive way to incorporate holiday décor in a modern way. This timeless pattern is one of our favorite ways to bring instant coziness to a room. When it comes to fall decorating ideas plaid has almost become a staple. Plaid is falls fabric. Keep it simple by adding plaid napkins as a subtle accent or create more of a focal point by covering the table in a plaid tablecloth or runner. Since plaid is a bold fabric be cautions when mixing in other patterns. It’s best to let the plaid be the statement all on it’s own and solid decor for the remainder of the table. 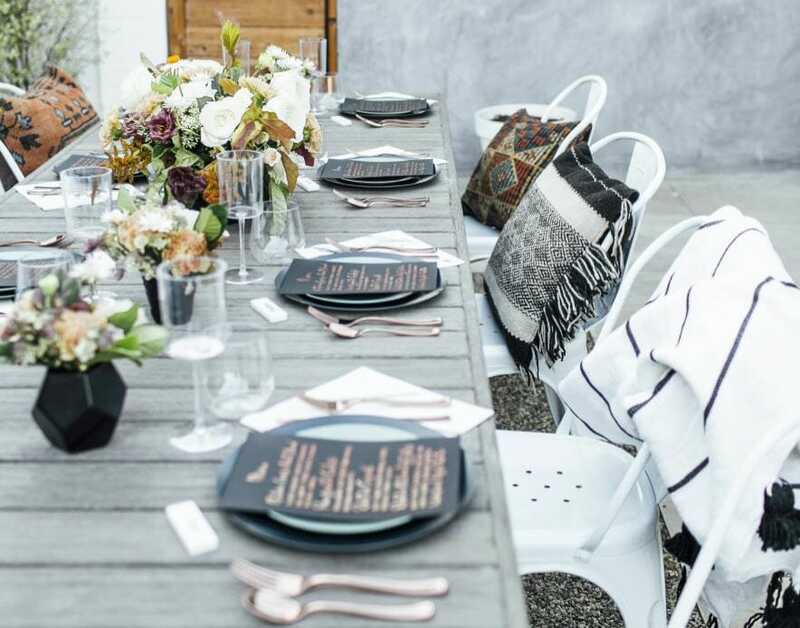 Designer tip: Can’t find the perfect tablecloth? 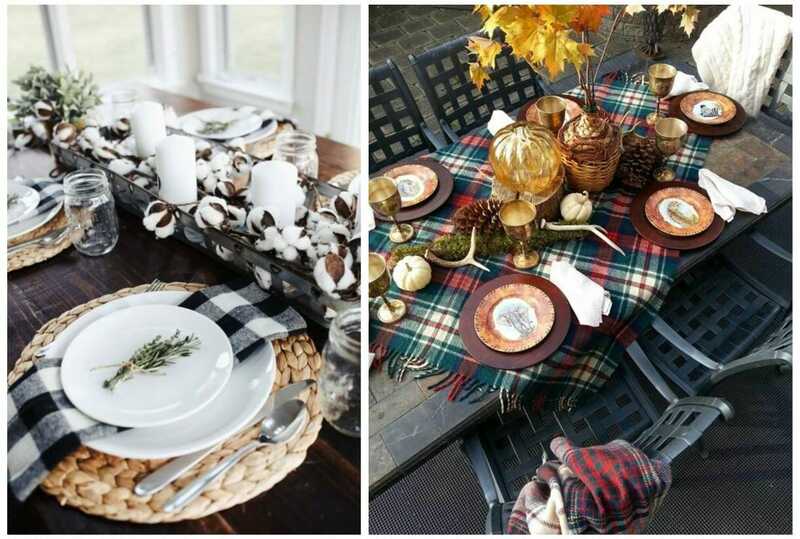 Use a plaid blanket to give a cozy texture to the table! Accordingly, we have saved the best for last. This easy fall table decorating idea is a great way to remind ourselves what this day is all about. 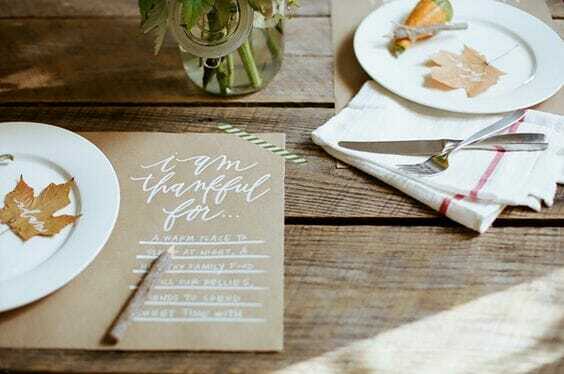 Start a new tradition in your home with placemats that are asked to be written on. It’s sure to be an unexpected addition everyone is certain to love. 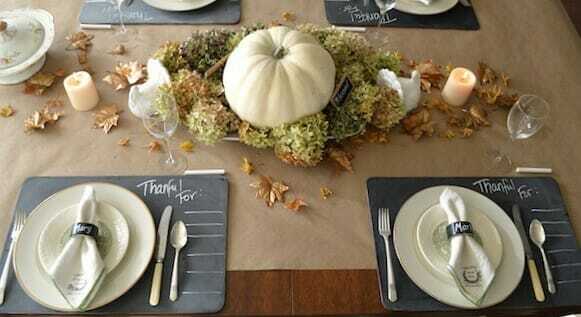 An easy way to do this without having to buy individual place mats is by using a roll of Kraft paper. Not only is your table protected from spills and stains, your guests can write directly in front of them. Whose inner kid doesn’t like drawing on the table? Especially for constructive reasons! Designer tip: Don’t forget to include a pen! Set them off to the side to pass out or include them at the place setting. With this in mind you are equipped to make the ultimate Thanksgiving table that your guests will love. In the midst of all the preparation leading up to this delicious day be sure to take a moment, step back, and remember all of the things you are thankful for. Need more advice than that? Online interior design help is at the tips of your fingers. Schedule a free consultation today to get started!